Two packages arrived today; one from Founders Performance and one from Classic Industries. Here is my unboxing video. 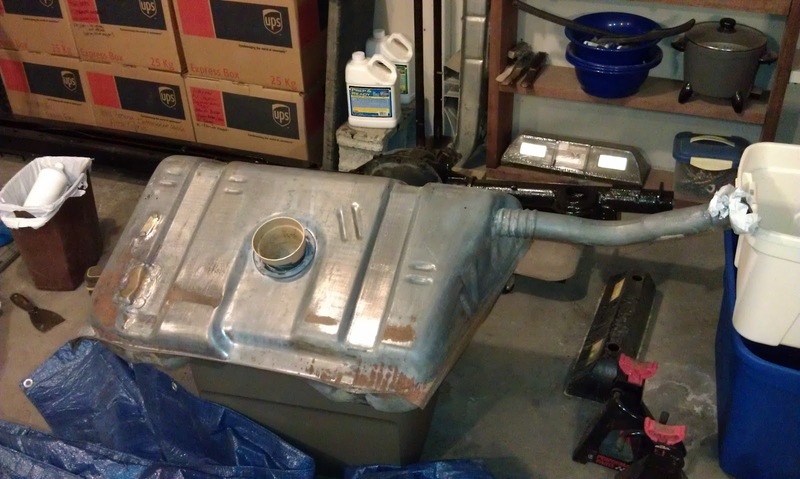 Today was warm enough to start painting KITT's fuel tank. I set the tank on saw horses with a tarp underneath and used the flower pot to seal the opening. Because of the way the fuel tank is shaped I am going to have to paint it in two parts (top half and bottom half). 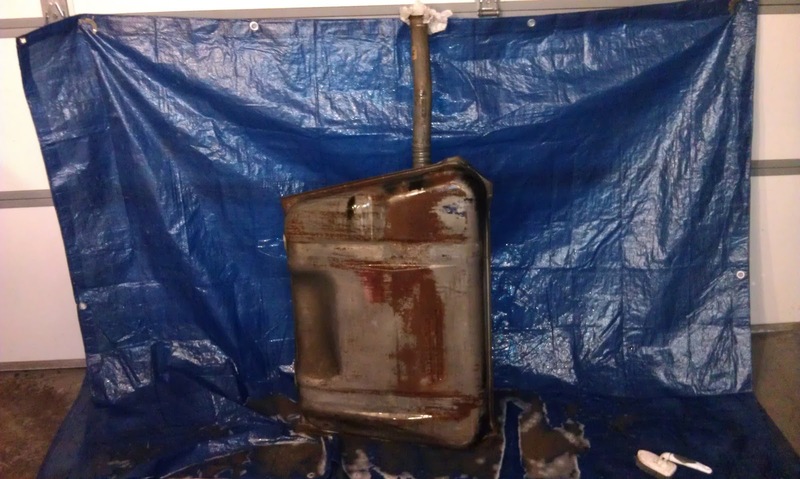 The top half of the fuel tank will only get two coats of POR-15 because it sits against the car and will not be exposed. Today I did a test fit of the new subframe connectors. I made a quick video showing how they mount under the car and how they differ from the more common subframe connectors on the market. 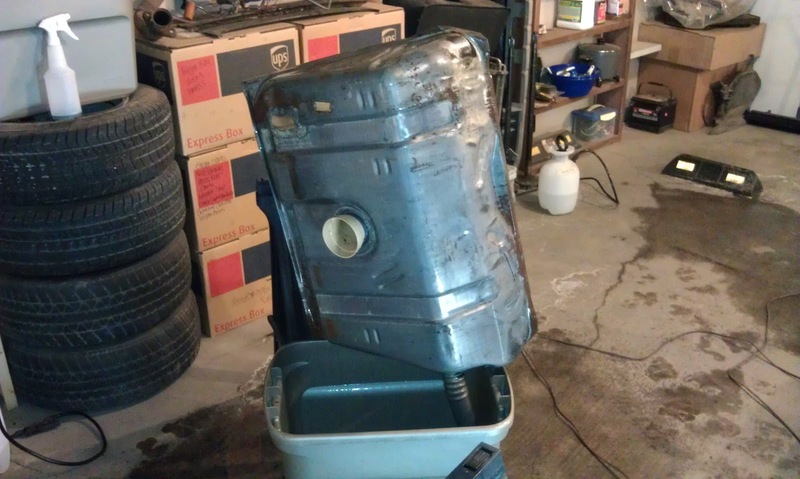 I also prepped the exterior of the gas tank so I can paint it with black POR-15 tomorrow. I received two packages, one from 1A Auto and one from TDS (Top-Down Solutions). Here is my unboxing video. I received a second package in the mail late this afternoon. It was a third package from Energy Suspension. Here is my unboxing video. I received a mystery package today from "Order Fulfillment Center in Kansas City, KS". Here is my unboxing video. I mentioned in my video that the box from Energy Suspension seemed small. I was right. It is because they did not send my clam shell engine mount bushings, the transmission mount bushing, or the lower control arm bumpers. There was also no packing slip or invoice in the box. I have contacted the company, and hopefully this will be remedied next week. I give Energy Suspension an A+ for amazing, super fast shipping, but a D- for order accuracy. The parts I ordered from Energy Suspension arrived today. Here is my unboxing video. Somehow in the midst of everything the firewall was forgotten. I am not sure why I did not just paint this when we did the rest of the car; I do not remember why. I am sure we had a reason for not painting it, but now it escapes me. I know this area was MarineCleaned and prepped when we did the inside of the car. Sara's theory is we meant to paint the firewall when we painted the engine bay, and just forgot to do it. My focus today was on cleaning out KITT's interior. 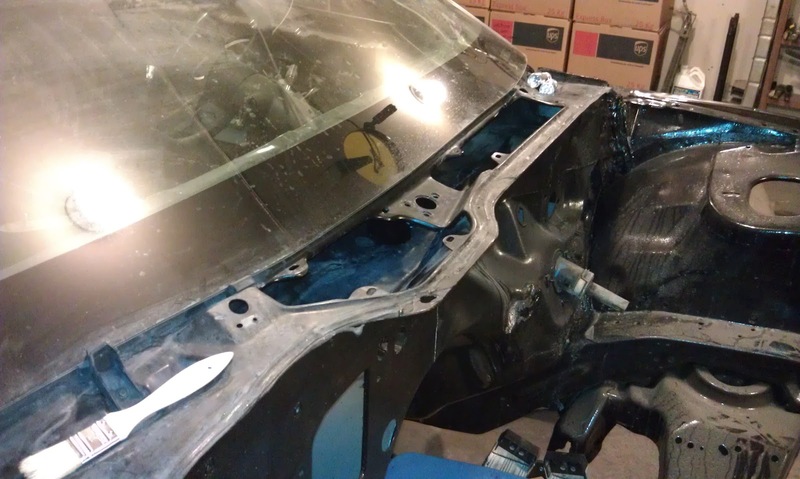 I had been storing finished parts inside the car to save room. I needed to clear this out in order to clean it up. The interior was very dirty, even dirtier than the outside was. 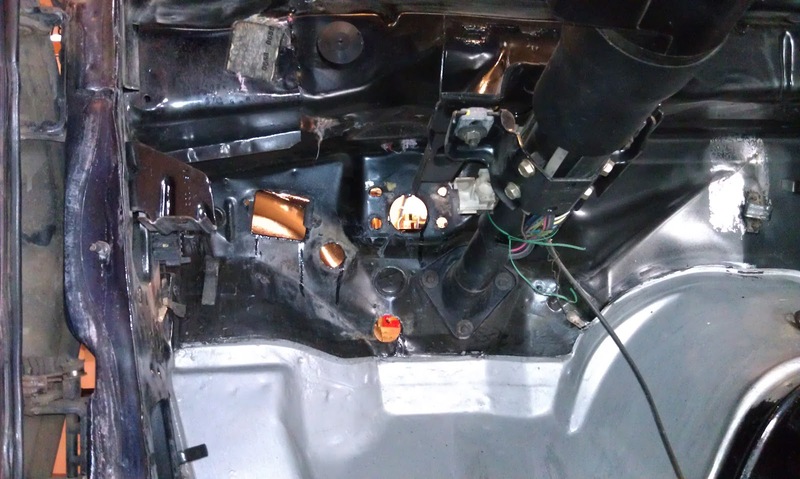 Here is what the inside of the car looked like before I started. 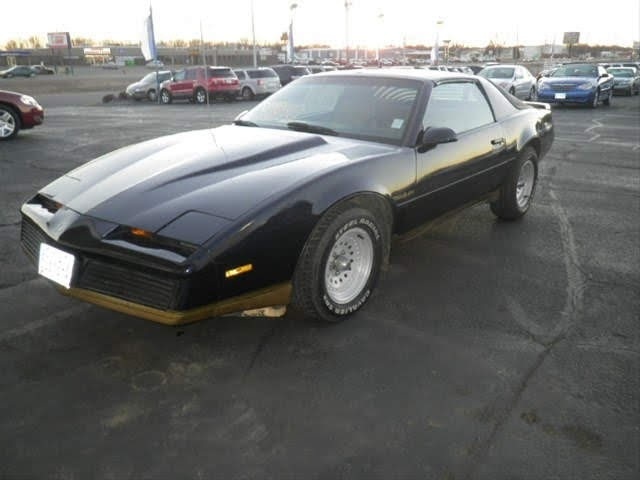 I am very quickly approaching the point where I will start putting KITT back together. Today I spent the majority of the day gathering information and finding the best deals on the parts I am going to need soon. This afternoon Dad and I sealed the tank. Once we got the can of fuel tank sealer open (which was incredibly difficult) we took turns stirring it. 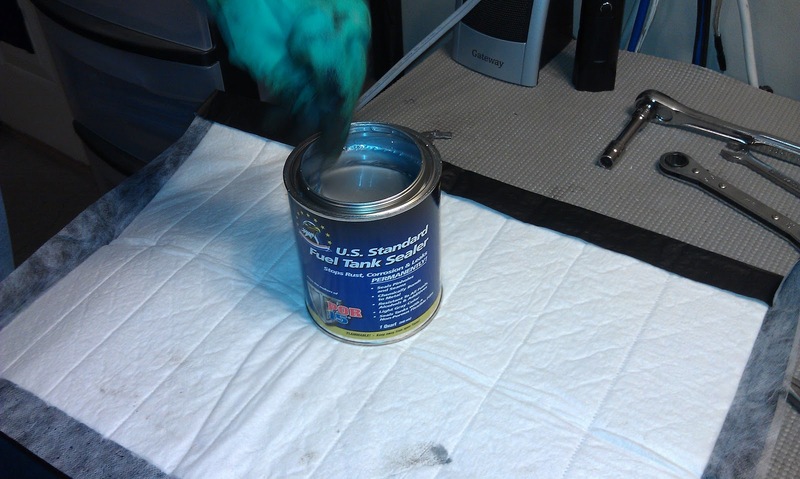 The directions on the can say it needs to be stirred until the sealer is a uniform color. It took almost 20 minutes of stirring before we decided it was good enough. I started this morning by prepping the fuel tank. The kit I ordered came with a quart of Prep and Ready, which I poured into the tank and then sealed it with my flower pot. 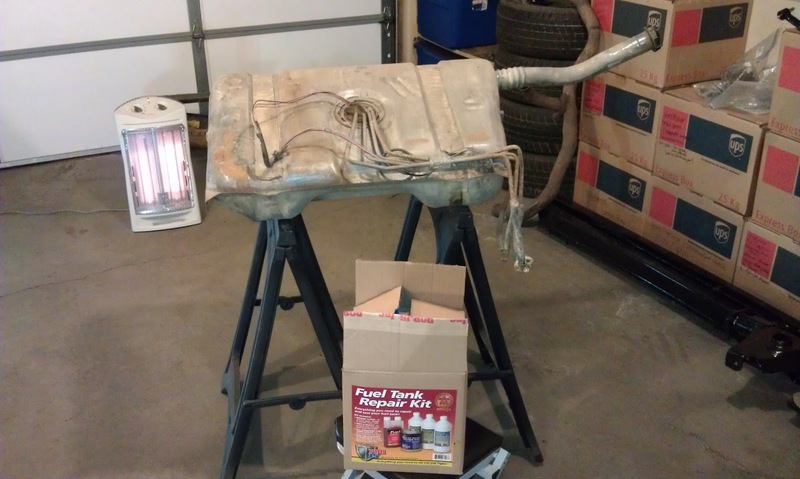 The solution has to sit for twenty minutes on each side of the fuel tank so the entire inside of the tank is thoroughly treated. Today I used MarineClean and a scrub brush on the exterior of the fuel tank. I wanted to get it clean so there was no chance of dirt falling inside the tank while I did the Prep and Ready and sealing stage. I put two tarps up by the garage door and set to work. If you are currently receiving updates on Project: K.I.T.T. by email, you will need to take action in order to continue receiving updates in your inbox. The service I have been using (FeedMyInbox) is shutting down on January 10, 2013 and you will need to switch to the new service (Blogtrottr) before that date. There is a new signup at the top of my blog for updates by email through the new service (Blogtrottr). Please signup again in order to continue receiving updates by email. Just enter your email address in the box and click the 'Get updates by email' button. Sorry for the inconvenience. Thank you for reading my blog, it means a lot to me! 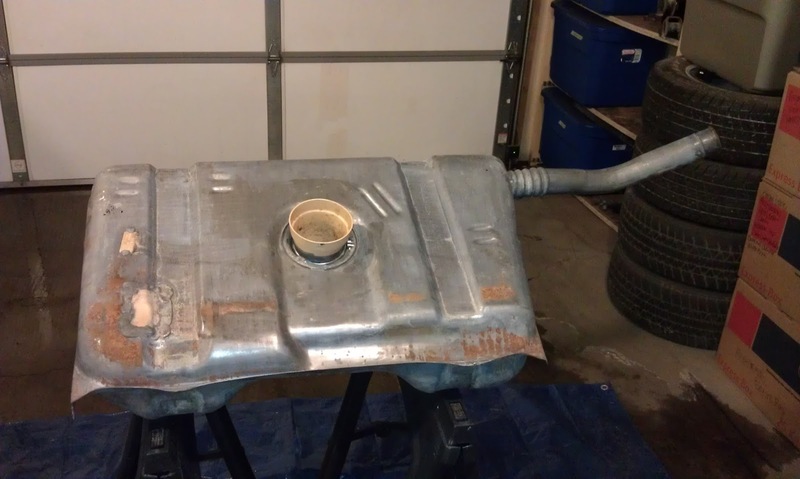 I started on KITT's fuel tank today. I bought a Fuel Tank Repair Kit from POR-15 a few months ago but have been putting this off because I knew it was not going to be fun. 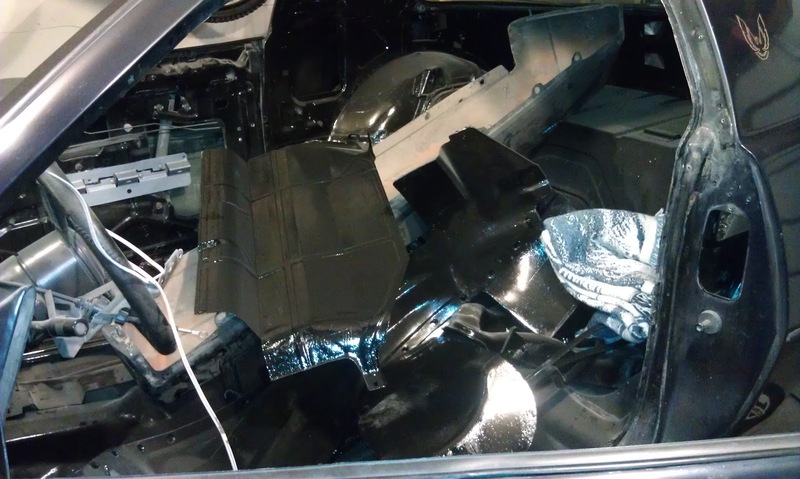 Today I cleaned the engine bay, underbody, and exterior of KITT. I decided to try vacuuming some of the dust off before using the MarineClean and water process I described in my post yesterday. Today I had not planned on working on the car because last night the forecast for today was a high of 14 degrees and I knew that I would not be able to get the garage warm enough to finish painting. However, when I got up at 7:00 this morning it was already 20 degrees outside and it ended up with a high of 25 degrees! They really cannot forecast the weather for anything. Not that I am complaining that it was warmer than it was supposed to be as it gave me more time to work on KITT. It would just be nice to be able to count on the forecast a day out at least. Okay, this is the end of my rant. I decided to try out the Eastwood Internal Frame Coating that I ordered. 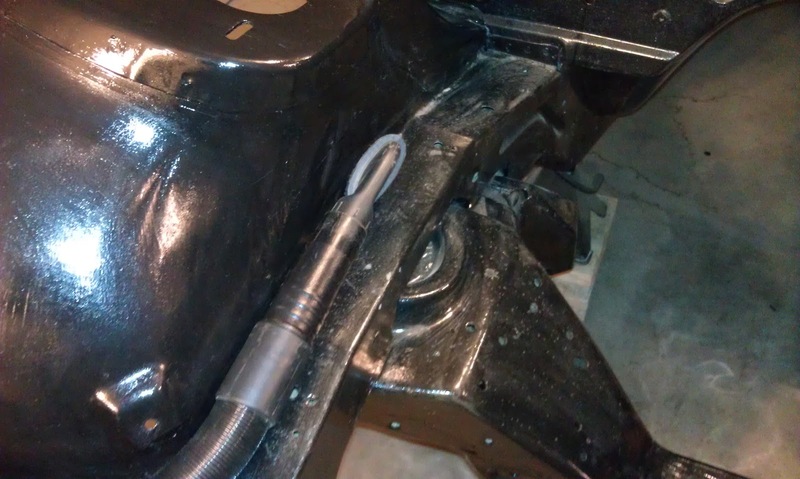 I needed to coat the insides of the lower control/trailing arm mounts. 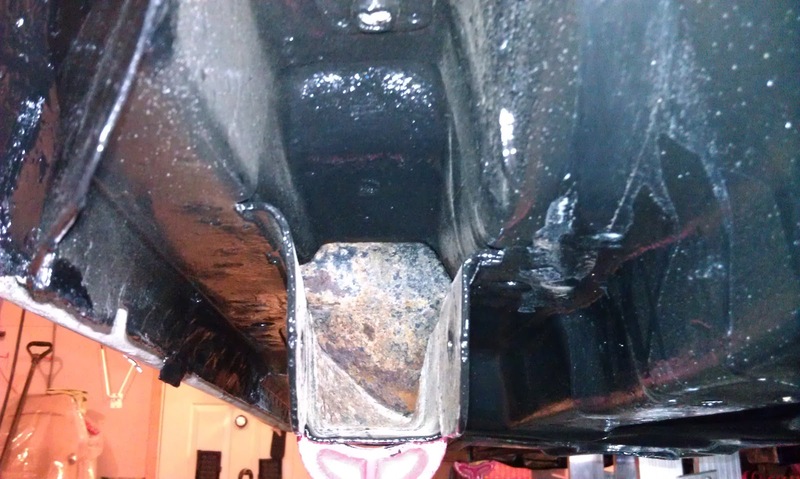 The picture below shows the rust inside the frame on the driver side. The curved area inside is actually the underside of the rear floor pan. The Eastwood Internal Frame Coating works as described. It is easy to use and I did not even need the spray nozzle extension for these areas. The odor is much stronger than POR-15. I think this has a lot more to do with it being an aerosol. It is also very runny, so be prepared to deal with drips and run off. The high viscosity is supposed to help the coating work its way into all the cracks and crevices. I cannot say much for the color choice (think pea soup), but then again this is meant for the insides of frames and should not be real visible. Today it was finally warm enough outside to allow the garage to be heated enough to finish painting. The cowl is the last of the large POR-15 projects (other than the fuel tank, which Sara just reminded me about). I wanted to treat this area but I have not been looking forward to figuring out how I was going to paint the entire length of it. Celebrating 1,100 Followers on Facebook! Celebrating 700 Subscribers On YouTube!